The services we offer our customers may involve one off removals and treatments of residential properties to long term call off contracts with Borough Councils, Transport Companies, Retail Parks and businesses. We can visit sites to give full specifications to solve graffiti problems or give advice on the products necessary for your own use. 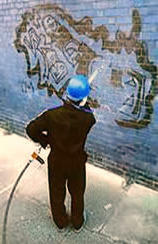 Digital photographs of graffiti sent by email to our office in Wolverhampton can be quoted for on the same day.